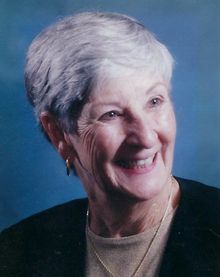 Mary Bolger (nee Lawrence), 82, of Avon, Ohio, formerly of Elgin, Illinois passed away peacefully surrounded by her family Sunday, February 3, 2019. She was born in Davenport, Iowa on July 7, 1936 to Stewart and Loie (nee Granke) Lawrence. Loving mother of Marcia (Jeffrey) Tanner and Susan (Chris) Smith; cherished grandmother of Erin Tanner, Shannon Smith, Lauren Tanner, and Haley Smith; dear twin sister of Margaret (Jim) Grotemeyer; sister-in-law of Patsy and Glen Lose and Gary Bolger (Betty, deceased). Preceded in death by her beloved husband of 44 years, Mike Bolger; sister Donna Farman; brother-in-law Jay Farman; and. parents Stewart and Loie Lawrence. Mary enjoyed working at the Berea Library before retiring to Naples, Florida. Mary and Mike were blessed with many friends during their snowbird years. Mary was grateful to volunteer for many years at Vineyards Elementary School in Naples, Florida. She also enjoyed golf, playing bridge and crocheting. Time with family and friends was her most cherished activity. Family will receive friends Friday, February 8, 2019 from 4:00-7:00 pm at BUSCH FUNERAL HOME 32000 Detroit Rd., Avon. Funeral service will be held Saturday, February 9th at 10:30 am at the Westlake United Methodist Church 27650 Center Ridge Rd., Westlake. Officiate will be Reverend Mollie Brown. Interment will follow at Lakewood Park Cemetery.